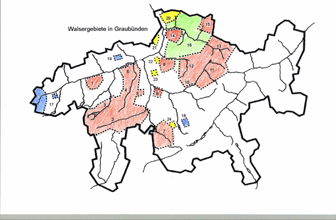 Since the first half of the 13th century there have been settlements of Walser in Graubünden. At different times the German speaking settlers moved eastwards after Rätien, over the Oberalppass into Bündner Oberland, where Obersaxon remains as a Walser settlement, from here south in Rheinswald and into the landscape of Davos. The earliest documents, Erblenhensbriefe (Loan letters), which were issued to settlers by the Freiherrn (Barons) von Saxmisox and the Freiherrn von Vaz originate from Rheinwald (1286, occupied from 1274 according to documentation) and from Davos (1289). From these main colonies they spread into the neighbouring "Talschaften" (Valley communties): from Hinterrhein to Vals, Safien and eventually from here onwards to Avers and Mutten, from Davos to Klosters and through Prättigau up to Schiers with the high settlement St. Antönien, Furna and Valzeina on the valley side as well as into neighbouring Schanfigg up to Churwalden and Parpan.